Bit very confused right now . 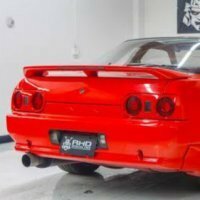 i have just recently installed a Bilsten kit into my r33 with 1 front camber kit and 2 rear camber kits. During installation we ran into an issue with the rear camber kits - whiteline plus W62544. We got some advice from a very reliable source who advised to that there are 2 arms involved per side, the upper control arm (90 degrees to the hub) and the traction rod (45 degrees to the hub). 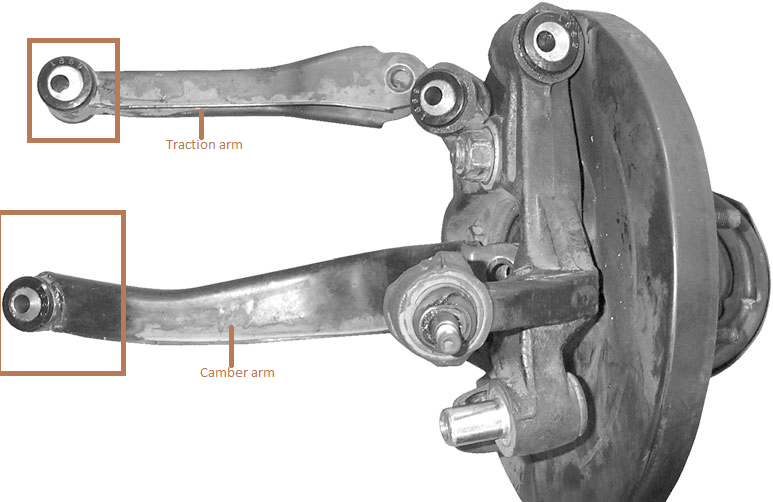 The bushes go in the upper control arm itself and the traction rod itself, at the inner pivot point- the 2 arms each side should maintain their relative lengths to avoid bump steer being introduced by the changes in dynamic angles. Installed as advised. Now that everything was installed i went to take my car to a very very reliable and well known suspension specialist who has worked on many of the top skylines - who advised the rear camber kit was installed wrong and from what i could gather ,he expected both the inner and outer bushes on upper control arm. Question is what is the correct installation of two W62544 kits ? This is a pic of the W62544 kit; And the one with the yellow bushes is the KCA347 kit. 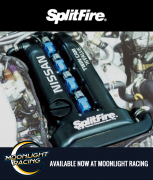 to suit most performance Nissans. "loose" and nervous when cornering. to achieve a reduction of 0.75 degrees in base camber. achieve a 1.5 degree reduction. As you can see there is no mention of the traction rod. Your specialist is correct. From my understanding; traction rod adjustment is a fairly complicated adjustment; usually involving removing the spring and swinging the suspension through it's full range to fine tune the adjustment. Still dont fully understand and feel maybe a bit of a terminology issue going on . 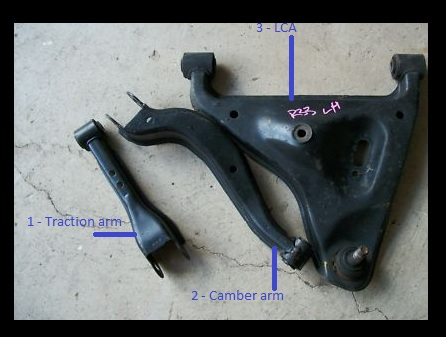 My understanding is the rear suspension has 3 arms - Traction arm (1) Camber arm (2) and Lower control arm (3) - please see picture attached for more details(picture 1). Im not sure if im getting the traction arm and the radius arm mixed up - can someone confirm or post a picture of the radius arm?? ?maybe 4 arms are in the rear suspension??? no he doesn't want it like pic 3 (that shows both offset bushes on the traction arm). there are 4 arms that control the rear wheel alignment. tie rod/toe rod (this comes from the HICAS rack/lock bar and adjusts toe). if you look at those pics you posted you'll see they have installed offset bushes into the outer mounts (on the hub) and the inner (in the arms) for both upper control arm and traction rod. the positions of the arms in the pics throws you off a bit as they are no where near their mounts. what you've done is fine, but perhaps he wanted more adjustment for the upper control arm? maybe he wants you to just buy 1 more kit to fit the two outer mounts for the upper control arm? 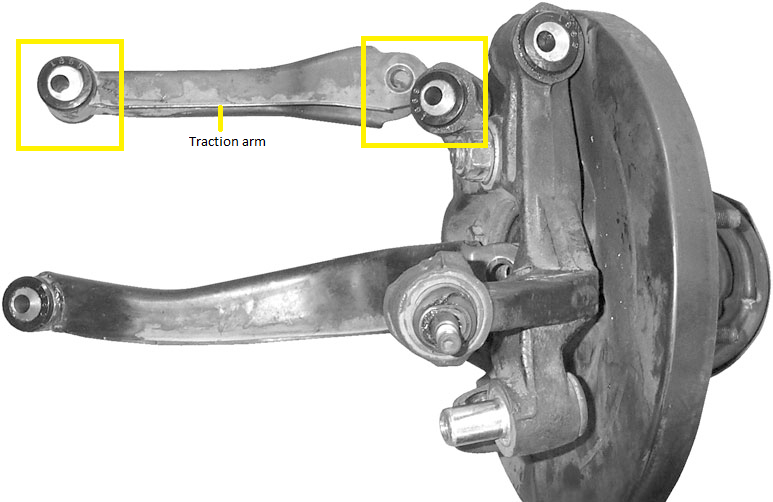 you are right, ideally you should be adjusting the traction rod whenever you are adjusting the upper control arm. aus Whiteline Available at Moonlight Racing! 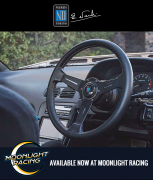 aus Nardi wheels available at Moonlight Racing! 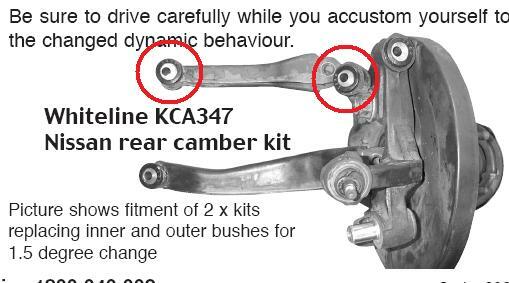 R34 Adjustable Camber Arm Reviews. New hypergear fitted over the weekend.